Table place cards (with space for you to write the guests name) including a message from ASH. The front side can be kept for the name only with our message on the back of the folded card or if you’d prefer you can have space for the guests name and our message just underneath their name. Its your call. The cards will be sent flat packed and perforated for easy disassembly/folding – its definitely best to have them flat packed to allow you write the guests name with little effort. These are printed and scored on top quality white card (a5 landscape) and include a personalised message on the front of the card. Inside we’ve included a personalised thank you from everyone in ASH and a little introduction to ASH. Also on the inside are a few stories about some of the animals in our care. Depending on the number of tables we’ll arrange to print a few variations of these cards with different animals stories on each. Rather than directing your guests to “table 3″ at your reception you could direct them to a particular animals table like “Willis’ table”. It may not always be for everyone but has certainly proven quite a popular and fun choice in the past and the double sided card slots nicely into any table number holder at any venue. 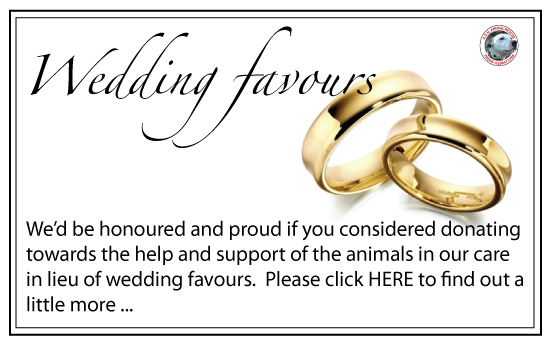 We ask for a minimum donation of 150 euro for wedding favours (donations can be made online (see above) or otherwise). You can get in touch with us directly via ashlm@eircom.net or through Caroline (one of our volunteers at cad7@mac.com) who’s on hand to discuss and explore this part of your wedding with you and can send you a few samples via email. We’ll do everything we can to get it right for you both on your special big day! Best of luck on your big day from everyone in ASH – exciting times!